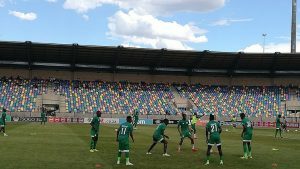 Bloemfontein Celtic soccer team says it remains positive even during challenging times in the club. The club continues to sink deeper into financial crisis and its supporters have intensified their protest to boycott the club’s home fixtures. This is in a bid to force Chairperson Max Tshabalala not to sell the club. Celtic is facing Free State Stars on Sunday afternoon in the province’s derby at Dr Molemela Stadium. “When we look at the current situation in the Bloemfontein Celtic Football Club, you also look at the positive to say our MDC club has just been crowned as champions and the team will be going overseas. But when we also look at what is happening today, we are engaged in one of the biggest games in the country with the Free State Derby with Bloemfontein Celtic against Free State Stars and as a team we are looking forward to this game this (Sunday) afternoon to make sure that we try and fight very hard to collect maximum points so that we can consolidate our position on the log,” says Celtic Spokesperson, Sello Nduna. The post Bloemfontein Celtic remains positive despite financial crisis appeared first on SABC News – Breaking news, special reports, world, business, sport coverage of all South African current events. Africa's news leader..